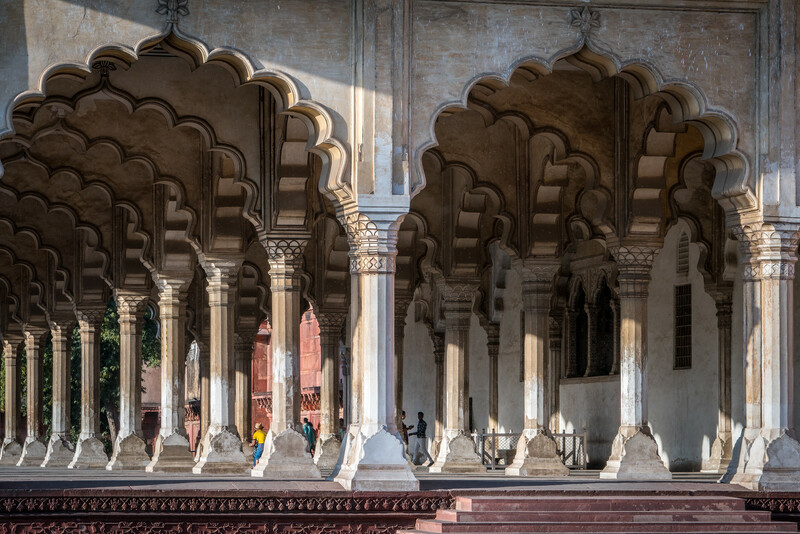 The Agra Fort really gives you an impression of what it was like to live like a Mogul Emperor. 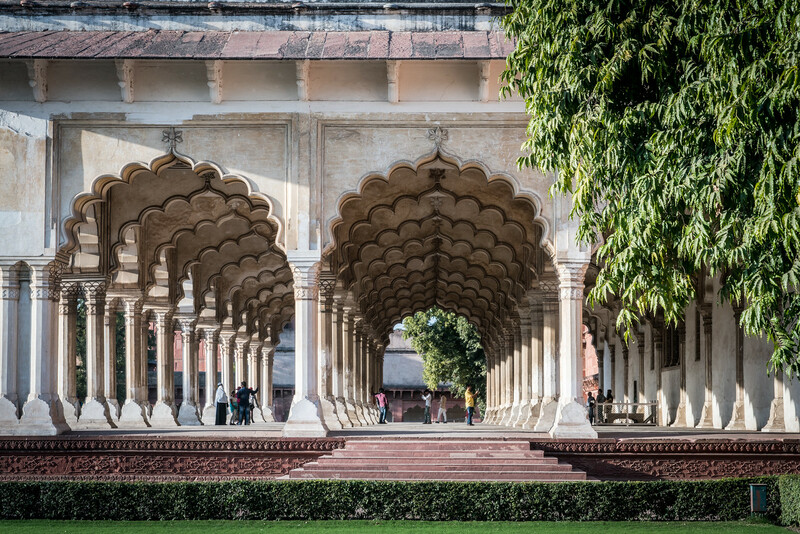 Unlike the Red Fort in Delhi, the Agra Fort gives a much stronger impression of being a palace. The buildings, which were used as residences for the royal family, are almost entirely covered with marble and semi-precious stones. The fort is also very close to the Taj Mahal and one can easily be seen from the other. In fact, if you visit the fort in the afternoon, you can get excellent photos of the Taj Mahal. The Red Fort is a popular destination in conjunction with visits with the Taj Mahal as the two are so close together. Both attractions can easily be visited in a morning or afternoon. The late afternoons are probably a better time to visit Fort Agra as most of the day trips from Delhi will be gone by then, and the crowds will be smaller. Agra Fort is a cultural UNESCO World Heritage Site in India. This historical fort is located in Agra and was inscribed in 1983 during the 7th session. The historic fortress is more commonly known as the Red Fort. It served as a residence for the Mughal Dynasty emperors until the early 17th century. It only ceased to serve as the official royal residence when the capital of India was moved from Agra to Delhi. Agra Fort is located only a little less than 3 kilometers from another popular UNESCO site in India – Taj Mahal. 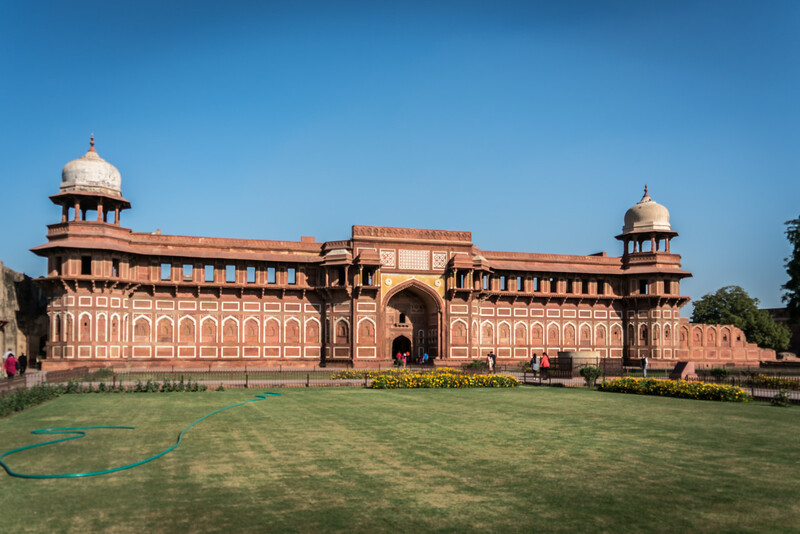 Agra Fort is a historical fort but many refer to it as a walled city. This speaks to the expanse and the importance of the fort as part of the city of Agra. The fort sits on a 94-acre land area that features a semi-circular plan. The fort lies parallel to the Yamuna River and also has walls that reach up to 70 feet high. There are four sides to this fort and each has their corresponding gates. Two of the fort gates are called “Lahore Gate” and “Delhi Gate”. 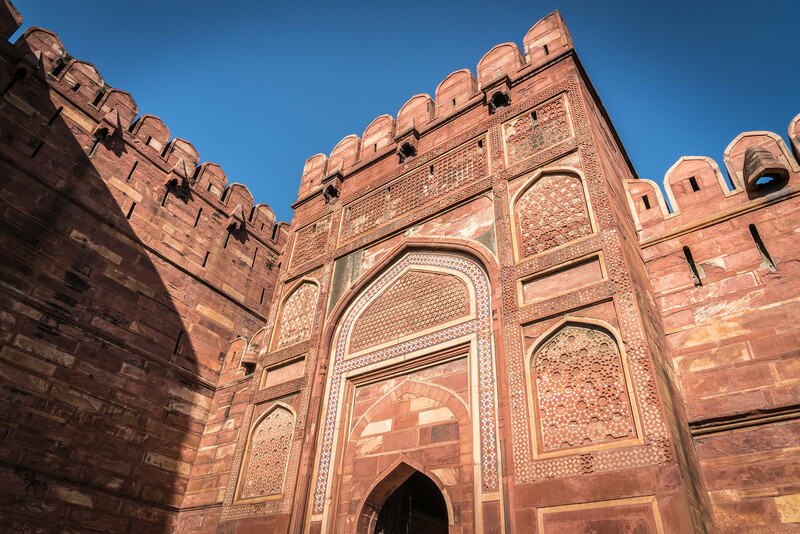 The Delhi Gate is considered monumental and one of the grandest out of all four of the gates. This gate was built in 1568 in order to boost the security of the fort. At the same time, it also served as the emperor’s formal gate. The gate features embellishments made with white marble. Meanwhile, there is a wooden drawbridge that is intended to cross the moat and connect the gate to the mainland. To this day, the northern portion of the Agra Fort is still being used by the Indian military. For this reason, the Delhi Gate is intended for official use only and is not open for public. Tourists who want to visit the Agra Fort are allowed to enter through the Amar Singh Gate. This is also where the ticket booth is located so you can enter the fort. 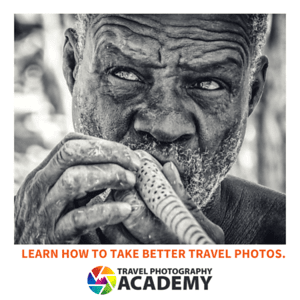 This UNESCO site is easily overshadowed due to the prominence and popularity of the nearby Taj Mahal. However, this 16-century fortress is one of the finest Mughal forts that was ever built in India. 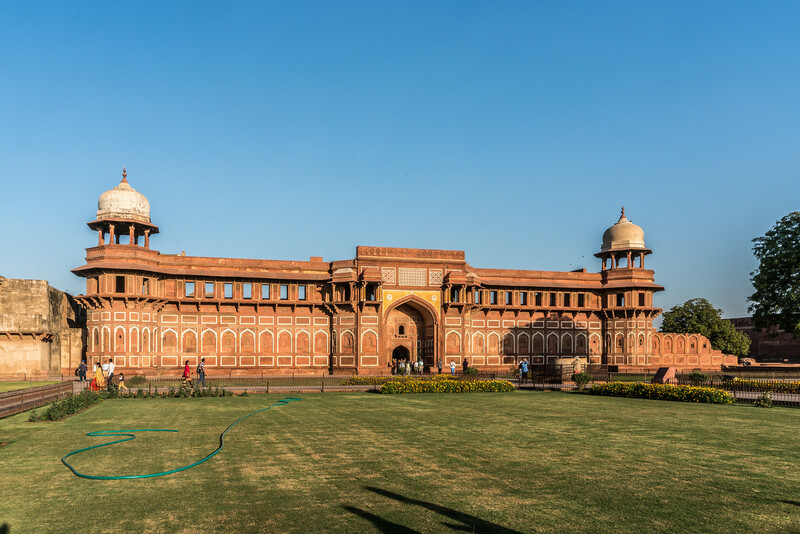 This palatial red sandstone fort will have you exploring courtyard after courtyard due to its immense size. When you are able to explore its ground, which is the only time when the grandeur of this site begins to sink in. Aside from the purpose on which it was built for, Agra Fort is monumental for its architectural history. There are about 500 buildings that feature the beautiful architectural design of Gujarat and Bengal that are built within the fort. However, these buildings were demolished to make way for the palatial fortress that Shah Jahan had envisioned. These buildings were destroyed from 1803 to 1862. It has also received numerous accolades that are linked to its architectural beauty. The Agra Fort UNESCO site is open for tourist visits. Foreign visitors are charged 520 Rupees to visit Agra Fort. Meanwhile, Indian nationals are only charged 20 Rupees. The fort is open all year round. View my complete list of UNESCO World Heritage Sites in India. Gary I like your style and post processing. By coincidence I found your site.. Still very surprised how you all get the time to blog. My days are full with shootings and it seems necessary to keep blogging. Yours is straight forward in the jungle of blogs really. Love this perspective, the arches so well formed.